Can a Felon Become a Mortgage Broker? Job options may be limited for felons recently out of prison, but there are resources available. At some point, felons may want to consider a career in the housing industry. Those with experience or interest in this area might want to consider becoming a mortgage broker. 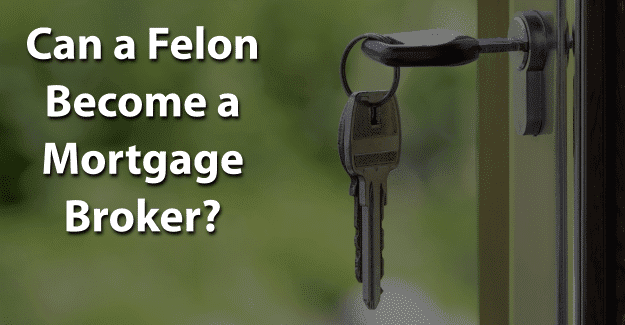 This blog post will cover the issue of whether or not a felon can become a mortgage broker. How Much Does a Mortgage Broker Earn? A mortgage broker serves as a go-between for a home buyer and a lender, working on behalf of a borrower to find the lowest interest rate for a home loan. He or she has the ability to compare mortgage rates with a number of banks and mortgage lenders to find the best loan program. During the loan process, the mortgage broker communicates with the bank and the borrower to keep the loan process moving smoothly. A mortgage broker is paid by charging a loan origination fee and/or a broker fee to the borrower. A mortgage broker is required to be at least 18 years old and have a high school diploma or a GED. A mortgage broker is required to have a loan originator license. An applicant must complete 20 hours of education for pre-licensing. In some states, additional training of one to five hours for state-specific regulations must also be completed. A number of schools offer courses, training programs, or certifications for mortgage brokers or loan officers. Several associations, including the Mortgage Bankers Association, offers training programs for candidates interested in a loan originator license. After completing education for this license, the Safe Act requires passing a mortgage loan originator license exam which is a national test covering federal laws and regulations for mortgage origination. The National Mortgage Licensing System handles each state’s mortgaging license requirements. The NMLS doesn’t review or approve license applications but serves as a central data location. According to the U.S. Bureau of Labor Statistics, there are approximately 318,600 working mortgage brokers and loan officers. The median wage for a mortgage broker was $64,660 in 2017. The median wage is that income at which half of the mortgage brokers earn less and half of them earn more. Experience and skill level could have a significant impact on these earnings. It also depends on where a mortgage broker works. Areas of the country that are the highest paying for mortgage brokers are the East and West coasts of the country. Job growth for mortgage brokers is expected to be 11% from 2016 to 2026. Continued development of new housing communities and expanding suburban areas will lead to this increased growth. Each state is required to complete a criminal background check on a mortgage broker applicant. This will involve federal fingerprinting which is sent to the FBI for review for any criminal convictions. Once completed, the background check is sent to the state for review. Each state will also complete a credit report on applicants. The specific requirements are up to each individual state regarding an acceptable credit score, but in most instances the credit score must be at least 580. In order to be successful in their pursuit of becoming a mortgage broker, it’s essential for felons to be honest about their background. They’re already working with the negative perceptions of being dishonest, untrustworthy, and unwilling or unable to follow directions from authority figures. There are re-entry programs, such as drug treatment, and educational opportunities for felons who need them. For many felons, having their felony expunged can give them the chance they need to begin with a clean record and succeed in becoming a mortgage broker. It’s a significant challenge, but it might be worth it for a felon that wants to become a mortgage broker. Having his or her record expunged and also documenting any training programs or additional education could make the essential difference in a felon succeeding in becoming a mortgage broker. What do you think about this blog post? Have you or someone you know been in the situation of trying to become a mortgage broker with a felony? What was that like for him or her, and how did he or she achieve success? Please tell us in the comments below.